Hello and happy Friday everyone! And happy almost Canada Day to my fellow Canadians! What are your plans for the long weekend? I have a pretty busy long weekend planned. I am shooting a wedding tomorrow, attending a BBQ and then going to my friend’s bachelor party. Sunday, I am heading to a friend’s bachelorette party and then to celebrate Canada Day at The Forks. Monday, I am going to spend the day sunning on the deck and catching up on my ever-growing summer reading list. Next up, The Guernsey Literary and Potato Peel Pie Society by Mary Anne Shaffer and Annie Barrows. What books do you have planned for your summer reading? On Monday, I also plan on having one or two of these delicious raspberry gin cocktails while lounging outside. I’m not one to drink much, but I when I do, I normally like something with a little gin. I know gin is not for everyone, but I love the flavour. Especially when mixed into a fruity cocktail such as this one! The chamomile syrup idea came from a recent Tasting Table newsletter. I love chamomile tea and was curious as to how a chamomile syrup would taste in a cocktail. The newsletter recommended pairing the syrup with gin – and I believe the recommendation was excellent. A really nice flavour profile between the tea, the gin, fresh lemon and sweet raspberries. I found the cocktail a little tart, so I added a little more syrup than the recipe called for. Wishing all of my American friends a happy upcoming 4th of July! What are your plans to celebrate? 1. Chamomile Syrup: In a small bowl, combine the boiling water and the chamomile tea. Steep the tea for 5 minutes then pour the mixture through a fine-mesh sieve set over a small saucepan. Discard the tea solids. Add the sugar to the pan and heat over medium heat, stirring, until the sugar dissolves (about 2 minutes). Turn the heat off and allow the syrup to cool. Transfer syrup to an air tight container and store in the fridge. Note: Syrup can be refrigerated up to a month. 2. Cocktail: In a cocktail shaker, add 6 raspberries and 1/2 ounce of chilled chamomile syrup. Muddle thoroughly. Add the lemon juice and gin. Fill the shaker with ice. Cover and shake vigorously. Strain through a fine-mesh strainer into an ice-filled glass with a wedge of lemon. Top the glass with club soda or sparkling water. Garnish with raspberries. The chamomile syrup was delicious! I have a bunch in the fridge now. Trying to decide what to do with it next. Might make some muffins and brush the chamomile on top like a glaze. We shall see! Sounds like you have a very busy weekend! I don’t really have any plans for the long weekend, other than going home and hanging out in my parents’ backyard…and probably drinking a couple of cocktails myself! I don’t know if I’ve ever had a gin drink because I mostly associate it with gin and tonics, which I don’t like. But I think I would like this drink! Those beautiful cocktails look so delicious! !..& the photos are really beautiful! Great idea..with the chamomile syrup !! Oh my! I do like the sound of these drinks. I will have to make a batch of the syrup! I highly recommend making the syrup. It was so nice! I am planning on making a few different syrups out of steeped tea to have around to add to drinks and possible baking too :) The chamomile syrup was wonderful. What an interesting way to take Chamomile…I must try this! It was delicious! So glad the recipe made quite a bit of syrup. Yum! Cannot wait to use the syrup in other recipes. what an innovative cocktail! sounds absolutely delicious! After I read the recipe for the chamomile syrup, I had to give it a shot ASAP. It was delicious with the gin and raspberries. Just a little sweet and a little tart – not too strong. Really nice. We have firewaorks over the lake in our backyard and awesome fod of course planned! Certainly :) Thanks for stopping by! Awe, thanks Natalie :) Loved the glasses too! Just bought them while in the States last week. Bought a whole bunch of pretty new dishes and things. I went a little overboard. *hah* Hope you had a terrific Canada Day weekend too! i love chamomile tea. 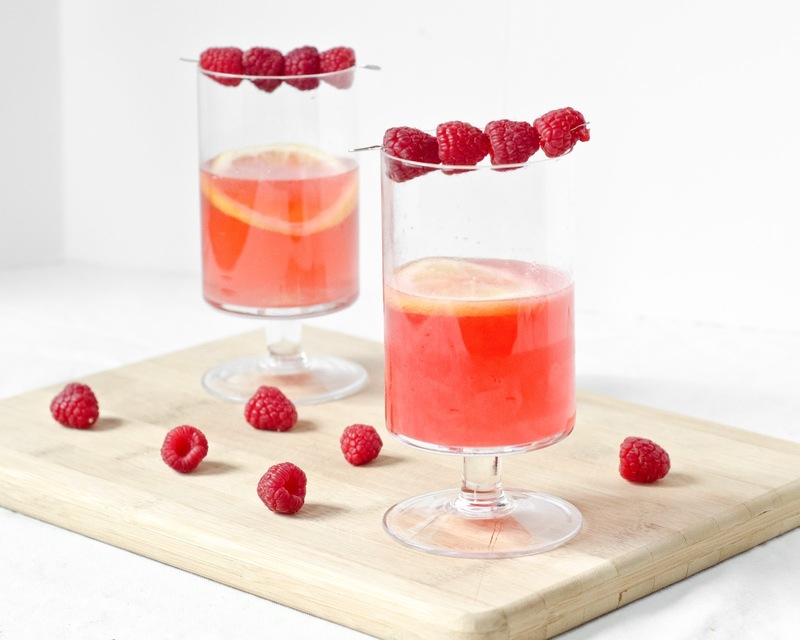 the cocktail fusion of chamomile tea with raspberries and gin sounds fab. Thanks Dassana :) I really love chamomile tea too. It was neat to use it in a fancier drink to celebrate Canada Day! Beautiful photo, I love the berry garnish! I am totally on a syrup kick lately, so thank you for giving me the idea of chamomile syrup! These look beautiful. Thanks Kiersten! :) What kind of syrups have you been making? And how have you been using them? I loved the chamomile in the drink, but think I may try and use the syrup in some baking too. Wish I had a sip of this.